Grapevine wreaths are very easy to make and inexpensive. You can use them for so many different seasons and decorations. You are only limited by your imagination. You can leave them natural colors or even spray paint them to match any dÃ©cor. I have made grapevine wreaths after they had been harvested for several days. I first soaked them overnight in a tub of water. If you know that you wonâ€™t be working with them that day, just coil them in a bucket and fill it with water. That makes them pliable enough to handle without cracking. Begin your coil with the thickest end of one vine. Form a circle in the diameter you want the wreath to be. Coil it into a circle the size you want your finished wreath. Please remember that the vines will shrink. I use a short piece of wire to tie the first coil secure while I continue wrapping. Wrap one entire length, twining the vine in and out around itself. Take the next vine - begin wrapping it in a different spot and wrap in and out in the opposite direction. Keep adding vines until the wreath is as thick as you want it. If needed, tie a short length of wire around the wreath at intervals to secure vines together. Continue wrapping it around itself and tucking in and twisting in more until you achieve the thickness you desire. I like to wrap my vines fairly loosely. This leaves me room to weave in and out of the vines easily, which adds a nice dimensional effect. Remove most of the leaves from the vine but leave a few of the "curls" for decoration. When you have finished your wreath, you can lay it in the sun to dry for a couple of weeks. You can also bring it in the house and hang it to dry. If you hang it to dry, you may want to change its position every couple of days so the shape will remain circular. 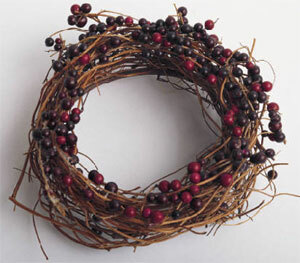 The nice thing about grapevine wreaths is that you can make any shape that you would like. Experiment a little bit and see what you can come up with. They are great for making swags and candy cane wreaths.